Today I get to put up another painting I don’t like. 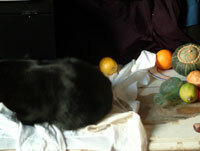 Looking at it now, I suppose there’s some feeling of the light in there, but really, the painting doesn’t live. I’m disappointed. I’ve put in the lightest and darkest points. Most of the background looks black, so I’ve put most of it in with a mix of alizarin crimson and ultramarine. 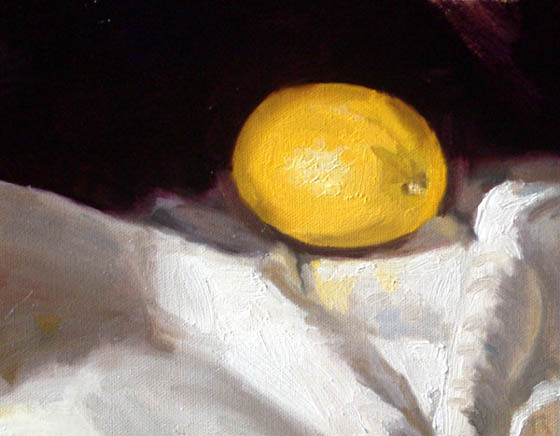 The light points on the cloth and lemon looked about equal, I put the lemon highlight in warm with a bit of cadmium yellow pale, and the cloth highlights cool with a bit of ultramarine. I’ve gone straight in and blocked in the lemon, with a couple of shadow notes around it. I shouldn’t really be putting in details at this point in the painting, its something I’m going to have to be more disciplined about. Next stage is to block in the main shadow shapes. 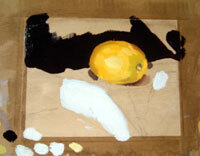 I think really I should have treated the lemon as part of this stage, and it would have held together better. 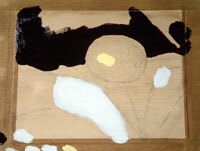 I’ve got the main tone blocks in, and theres my old friend the diagonal shadow. Things are not looking too bad at this point. I can feel the light, but its bothering me that I can’t get the highlights on the cloth as light as they should be. Actually what’s working against the feeling of light is that the lemon is too light, but I didn’t realise until later, until too late in fact. Everything I did after this point was to the detriment of the picture. What feeling of light there is at this point gets lost in the struggle to get the highlights right. In a desperate attempt to get the highlights on the cloth lighter, I scrape off the paint on the highlights and rub back the umber acrylic wash to bring up the white acrylic primer, then I paint them on again, pure flake white. That might have been a mistake. I got them lighter but I lost the blue cast to the highlights. I think I may well have lost the balance here, because I changed that large element and left everything else the same. Definitely the light has left the painting a bit afer that. 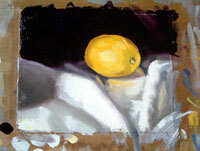 I press on anyway, putting in some more shadow accents, a bit darker, and some reflected light from the lemon. Everything after this was basically twiddling, resulting in the finished picture. 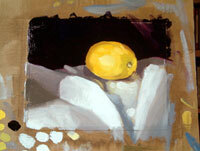 I dragged the background paint over the edges of the cloth behind the lemon, in what I thought would be a clever painterly touch to make it recede, but it made no difference, in fact it muddied the main plane of the picture, and made the whole thing more vague. 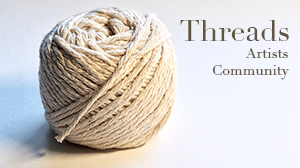 I probably would have gone on twiddling longer, but one of the cats jumped up on the arrangement and started pulling the cloth about. End of picture. Don’t believe me? Thats his shiny back front left. The kicker with this painting is that when it was done, I sat back with it next to the subject and realised that the highlights on the cloth were actually about right in tone. The lemon was WAY too light. I’m not sure what the lesson is there, if there is one. I guess it just comes down to a failure to see it properly,and the only answer to that is more practice. I was feeling pretty deflated at the end at this one, but writing it out has been kind of cathartic.The cloth is better than last time, a bit, and I did another painting. Ok so it wasn’t that good. On to the next one.